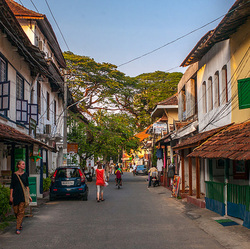 Princess Street is one of the oldest streets in Fort Kochi. The bungalows built in the European style and the other buildings of colonial architecture lining both sides of the street make it pretty as a picture. The buildings here, with bronze stucco walls and peeling plaster, house antique stores, cigar shops, provisional stores, curio shops, kiosks, cafes, restaurants, art galleries and so on. Some are being used as homestays for tourists. For the best view of the street, head for the Loafer’s Corner, a popular meeting place at the confluence of Princess Street, Peter Celli Street and Bastion Street.